Lysaer’s unstable integrity lies under threat of total downfall, and as his determined protector, Daliana will face the most frightening decision of her young life. Arithon, Master of Shadow, is marked for death and still hunted, when his critical quest to recover his obscured past entangles him in a web of deep intrigue and ancient perils beyond his imagining. Elaira’s urgent pursuit of the Biedar Tribes’ secret embroils her in the terrible directive of the Fellowship Sorcerers, while Dakar ― the Mad Prophet ― confronts the hard reckoning for the colossal mistake of his misspent past, and Tarens is steered by a destiny far from his crofter’s origins. War, blood, magic, mystery – and the most hidden powers of all – will stand or fall on their hour of unveiling. 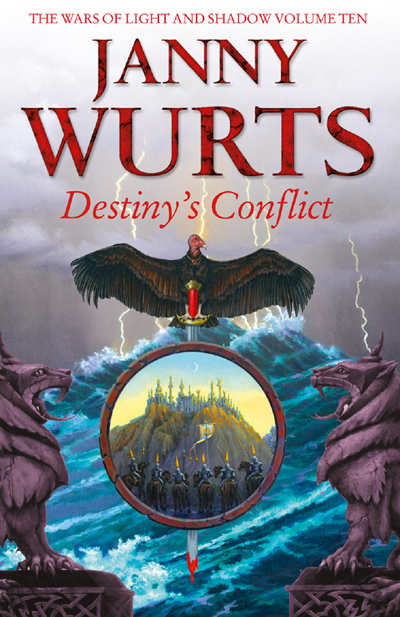 Through her combined career as an author and cover artist, Janny Wurts has written nineteen novels, a collection of short stories once nominated for the British Fantasy Award, and thirty three contributions to fantasy and science fiction anthologies. Best known for the War of Light and Shadow series, other titles include standalones To Ride Hell’s Chasm, Master of Whitestorm, and Sorcerer’s Legacy; the Cycle of Fire trilogy; and the Empire trilogy written in collaboration with Raymond E. Feist. Her paintings and cover art have appeared in exhibitions, including, NASA’s 25th Anniversary exhibit, Delaware Art Museum, Canton Art Museum, Hayden Planetarium in New York, and been recognized by two Chesley Awards, and three times Best of Show at the World Fantasy Convention. She lives in Florida with three cats and two horses, and rides with a mounted team for search and rescue. Life experience as an offshore sailor, wilderness enthusiast and musician is reflected in her creative work.